FOR RENT! 2005 Well-built neatly finished in and out, presently used as a medical office available April 1, 2017. 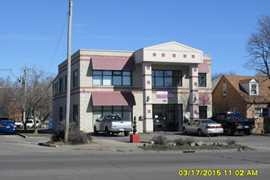 2 full baths, available parking in front/rear/side streets, tenant pays gas/ electric/ water, owner pays landscaping/ snow removal/ taxes, can be used for other offices. $2,400 rent is only for the whole ground floor, if tenant needs additional space, there are available spaces on the 2nd floor to be agreed separately, building also for sale for $499,500.